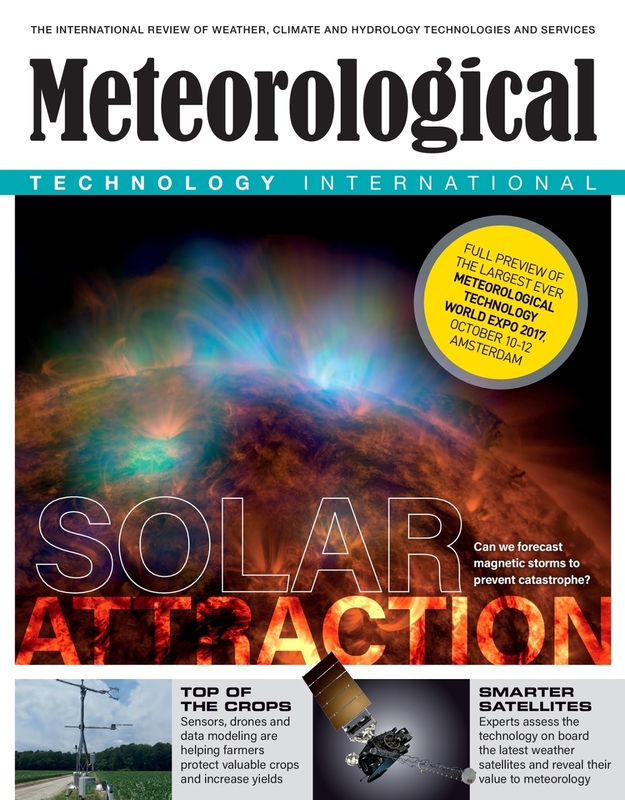 Meteorological Technology International: EarthCast Advanced Warning. 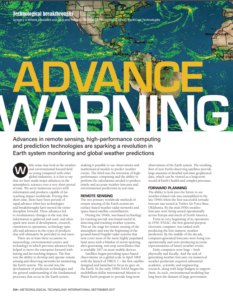 Advances in remote sensing, high-performance computing and prediction technologies are sparking a revolution in Earth system monitoring and global weather predictions. While some may look at the weather and environmental hazard field as young compared with other global industries, it is fair to say that we have made major advances in the atmospheric sciences over a very short period of time. We serve numerous sectors with information and products capable of far-reaching impact worldwide. During this short time, there have been periods of rapid advance when key technologies and breakthroughs have moved the entire discipline forward. These advances led to revolutionary changes in the way that information is gathered and used, and often spark new areas of development, research, transitions to operations, technology spinoffs and advances in the types of products that will ultimately be provided to end users. 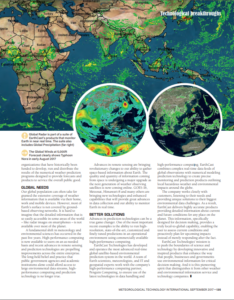 There are at least three occasions in meteorology, environmental science and technology in which previous advances have helped to move the enterprise forward with lasting and far-reaching impacts. The first was the ability to develop and operate remote sensing and observing networks for monitoring the Earth system. The second was the development of prediction technologies and the general understanding of the fundamental processes that occur in the Earth system, making it possible to use observations and mathematical models to predict weather events. The third was the invention of high-performance computing and the ability to perform the calculations needed to produce timely and accurate weather forecasts and environmental predictions in real time. The two primary worldwide methods of remote sensing of the Earth system are surface-based weather radar networks and space-based satellite constellations. During the 1940s, war-based technology for tracking aircraft was found useful in detecting and tracking weather systems. This set the stage for remote sensing of the atmosphere and was the beginning of the ground-based Doppler radar systems that now cover most of the more highly populated land areas with a blanket of storm-spotting, alert-generating, non-stop surveillance that is available 24/7 on most mobile devices. Satellites began providing space-based observations on a global scale in April 1960 with the launch of TIROS 1 – the first satellite designed and launched to focus its gaze on the Earth. In the early 1990s NASA began the multibillion-dollar international Mission to Planet Earth program to provide long-term observations of the Earth system. The resulting fleet of new Earth-observing satellites provide large amounts of detailed real-time geophysical data, which can be viewed as a long-term record of Earth’s health and complex processes. The ability to look into the future to see weather-related risk was exemplified in the late 1940s when the first successful tornado forecast was issued at Tinker Air Force Base, Oklahoma. By the mid-1950s weather forecasts were being issued operationally across Europe and much of North America. From its very beginning of its operations, in 1950, ENIAC, the first general-purpose electronic computer, was tasked with producing the first numeric weather prediction. By the middle of the decade,computer-generated forecasts were being run operationally and were producing accurate representations of future weather events. Early computers were huge – both physically and fiscally. And the task of generating weather forecasts via numerical weather prediction required substantial academic, scientific and engineering research, along with large budgets to support them. As such, environmental modeling has long been the domain of large government organizations that have historically been funded to develop, run and distribute the results of the numerical weather prediction programs designed to provide forecasts and products to service the overall public good. Our global population can often take for granted the extensive coverage of weather information that is available via their home, work and mobile devices. However, most of Earth’s surface is not covered by ground based observing networks. It is hard to imagine that the detailed information that is so easily accessible in some areas of the world – like radar images on smartphones – is not available over most of the planet. A fundamental shift in meteorology and environmental sciences has occurred in the past five years. High-performance computing is now available to users on an as-needed basis and recent advances in remote sensing and prediction technologies are propelling improvements across the entire enterprise. The long-held belief and practice that public government agencies and academic institutions alone could afford access to large environmental data streams, high performance computing and prediction technology is no longer true Advances in remote sensing are bringing revolutionary changes to our ability to gather space-based information about Earth. The quality and quantity of information coming from space is undergoing a major upgrade as the next generation of weather observing satellites is now coming online. GOES-16, Meteosat, Himawari-8 and many others are bringing new technologies and enhanced capabilities that will provide great advances in data collection and our ability to monitor Earth in real time. Advances in prediction technologies can be a true game changer. One of the most important recent examples is the ability to run high resolution, state-of-the-art, customized and finely tuned predictions in an operational environment using commercially available high-performance computing. EarthCast Technologies has developed and operates the most advanced real-time global satellite-based environmental prediction system in the world. A team of Earth scientists, meteorologists, and IT and geospatial experts work with the company’s high-performance computing partner, Penguin Computing, to ensure use of the latest technologies in data handling and high-performance computing. EarthCast combines complex real-time data feeds of global observations with numerical modeling prediction technology to create precise monitoring and prediction products outlining local hazardous weather and environmental impacts around the globe. The company works closely with customers, listening to their needs and providing unique solutions to their biggest environmental data challenges. As a result, EarthCast delivers highly accurate products providing detailed information about current and future conditions for any place on the planet. This information, specifically designed for decision making, provides a truly local-to-global capability, enabling the user to assess current conditions and proactively plan for upcoming impacts instead of merely responding after the fact. EarthCast Technologies’ mission is to push the boundaries of science and technology by developing innovative and inspired products that enhance the way that people, businesses and governments use environmental information for critical decision making. And it is this pioneering spirit that distinguishes it from other weather and environmental information service and technology companies.